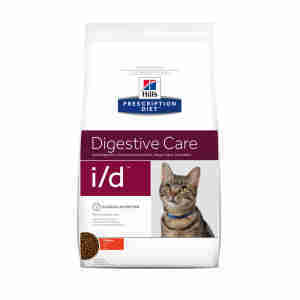 Hill's Prescription Diet Feline i/d is a complete food developed to ease the symptoms of cats with gastrointestinal disorders. 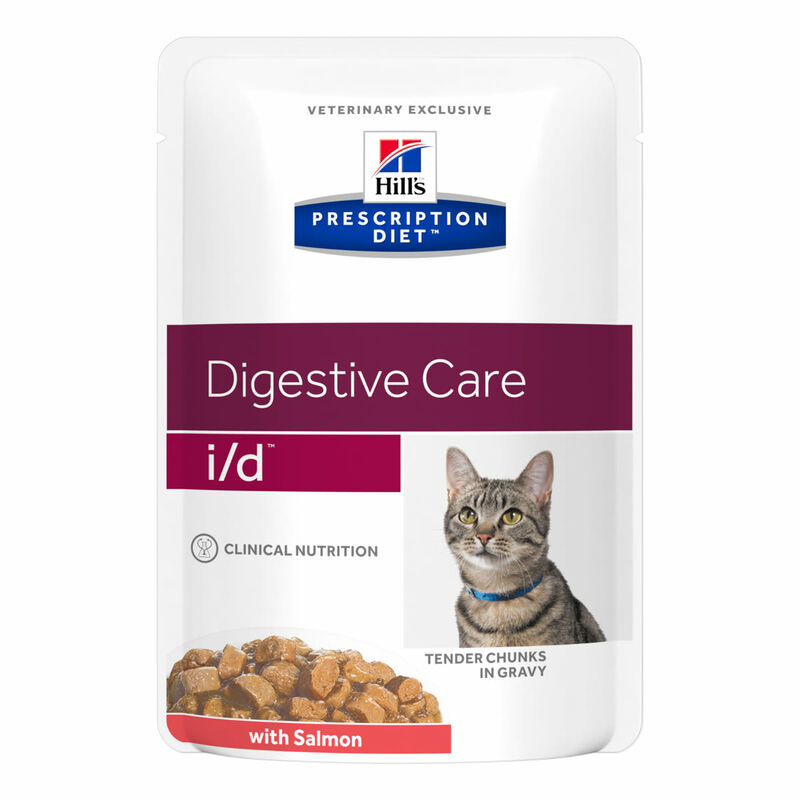 The recipe is designed to be highly digestible, to support your cat's digestive system and reduce the strain on it. A high level of antioxidants works to neutralise harmful free radicals, preventing them from aggravating your pet's symptoms. If your cat is suffering from diarrhoea or vomiting they may be short on essential minerals. With this in mind, the food contains electrolytes to help their body compensate for this and restore any nutrients it has lost. Plenty of high-quality fibre is also essential for a properly functioning digestive system and can create the optimum environment for healthy gut bacteria. You might have found that your cat has gone off his or her food since developing gastrointestinal issues. To help return their eating habits to normal, this food has been created with plenty of flavour and an enticing scent to tempt your pet. great flavour to tempt fussy or unwell pets. The first signs of a gastrointestinal upset are usually persistent vomiting or diarrhoea after your cat has eaten. Since these symptoms can cause dehydration and a drain of nutrients as well as being distressing for your pet, it's important to take them to the vet as soon as possible for examination and diagnosis. Gastrointestinal disorders might have a variety of sources such as food allergies and intolerances, or conditions such as colitis and inflammatory bowel disease. Subsequently, treatment for your pet's symptoms will depend on the nature and cause of their condition. Any issue affecting the digestive system is, however, invariably going to be influenced by diet, so it's likely that your vet will recommend a change of food as part of your pet's treatment plan. Because veterinary diets are formulated for the nutritional support of pets with specific clinical conditions, we recommend that you only use them under professional advice. For more information on feeding Hill's Prescription Diet Feline i/d to your cat, please consult your veterinary surgeon. Chicken (37%) and turkey meal, maize, brewers' rice, animal fat, maize gluten meal, dried whole egg, minerals, digest, dried beet pulp, cellulose, fructo-oligosaccharides, psyllium, taurine, vitamins, trace elements and beta-carotene. With a natural antioxidant (mixed tocopherols). Fat 19.4%, fibre (crude) 1.3%, moisture 5.5%, protein 36.1%. Vitamin A 8534 IU, vitamin B12 0.1 mg, vitamin C 100 mg, vitamin D 868 IU, vitamin E 600 mg, beta-carotene 1.5 mg, calcium 1.1%, carbohydrate 31%, magnesium 0.08%, Omega 3- fatty acids 0.28%, Omega 6- fatty acids 3.3%, phosphorus 0.87%, potassium 0.86%, pyroxidine 9.5 mg, riboflavin 9.5 mg, sodium 0.38%, soluble fiber 0.5%,taurine 2269 mg, thiamine 12.3 mg.
Chicken (25%), pork, maize starch, salmon, tapioca starch, dried egg, various sugars, wheat flour, pea protein, cellulose, sunflower oil, minerals, dried pork protein, yeasts, vitamins, trace elements, taurine and beta carotene. Coloured with natural caramel. Fat 4.2%, fibre (crude) 0.53%, moisture 79.5%, protein 7.8%. Vitamin A 16453 IU, vitamin B12 0.02mg, vitamin C 19mg, vitamin D 262 IU, vitamin E 114 mg, beta-carotene 1.5 mg, calcium 0.21%, carbohydrate 6.6%, magnesium 0.02%, Omega 3- fatty acids 0.11%, Omega 6- fatty acids 0.9%, pantothenic acid 2.7 mg, phosphorus 0.19%, potassium 0.19%, pyroxidine 2.1 mg, riboflavin 2.1 mg, sodium 0.1%, sulphur 0.19%, soluble fibre 0.38%, taurine 469 mg, thiamine 2.7 mg.
Chicken, pork, salmon (4%), maize starch, tapioca starch, dried egg, various sugars, minerals, wheat flour, pea protein, cellulose, sunflower oil, dried pork protein, vitamins, trace elements, taurine, yeasts and beta carotene. Coloured with natural caramel. Fat 4.4%, crude ash 1.6%, fibre (crude) 0.55%, moisture 78.5%, protein 8.2%. Vitamin A 16638 IU, vitamin B12 0.02mg, vitamin C 19 mg, vitamin D 341 IU, vitamin E 114 mg, beta-carotene 1.5 mg, calcium 0.24%, carbohydrate 6.8%, magnesium 0.02%, niacin 32.3 mg, Omega 3- fatty acids 0.15%, Omega 6- fatty acids 1.05%, pantothenic acid 2.8 mg, phosphorus 0.18%, potassium 0.2%, pyroxidine 2.2 mg, riboflavin 2.2 mg, sodium 0.1%, soluble fibre 0.31%, taurine 793 mg, thiamine 2.8 mg.
Pork liver, chicken (17%), rice flour, potato protein extract, animal fat, minerals, cellulose, dried beet pulp, taurine, fructo-oligosaccharides (0.12%), vitamins, psyllium and trace elements. Fat 6.1%, crude ash 1.8%, fibre (crude) 0.65%, moisture 75.5%, protein 9.9%. Vitamin A 48293 IU, vitamin B12 4.7 mg, vitamin C 108 mg, vitamin D 48 IU, vitamin E 311 mg, beta-carotene 1.5 mg, calcium 0.29%, carbohydrate 6.1%, magnesium 0.02%, niacin 38.8 mg, Omega 3- fatty acids 0.07%, Omega 6- fatty acids 1.11%, pantothenic acid 9.9 mg, phosphorus 0.2%, potassium 0.26%, pyroxidine 3.3 mg, riboflavin 5.3 mg, sodium 0.1%, soluble fibre 0.38%, taurine 1716 mg, thiamine 37.9 mg.
My cat has been on this for many years and still loves it. I mainly leave the dry food down 24/7 but she spoilt with i/d pouches on weekends. 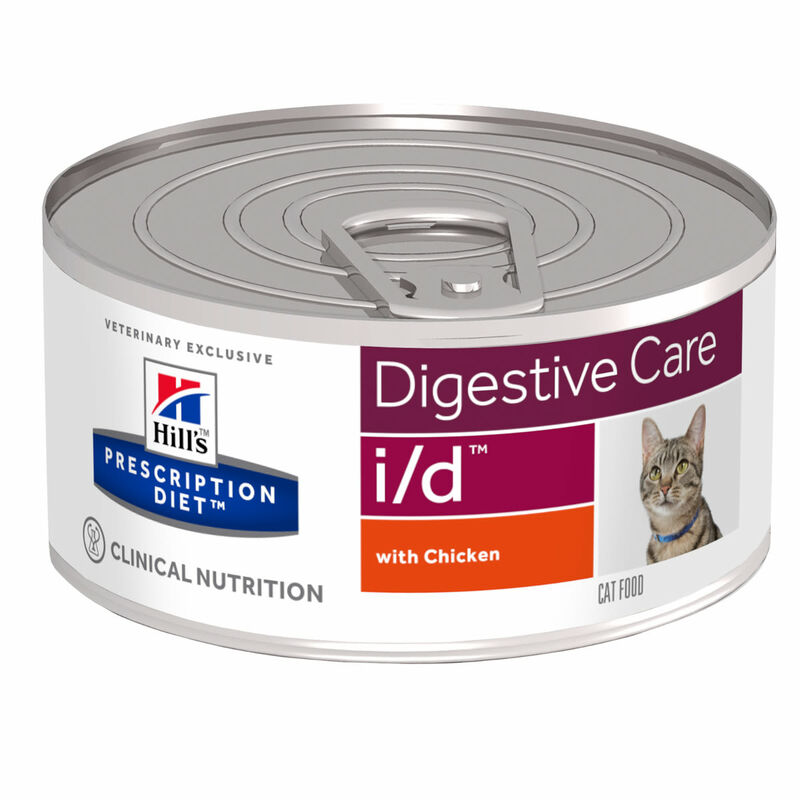 My cat has been on the i/d biscuits for years, and rarely gets fed up with them. Occasionally we branch out to a few pouches for a change, but she’s then happy to go back to the biccies. Helps her dodgy tummy and good value. Great buy. Both my cats have been on this for years,and never gets fed up with it. Both my cats love l/ D ,they have been on it for years.Definately helps their delicate tummy’s.Also very good value.So a win ,win all round.